With 8 outlets, this protective unit is great for small- and medium-size businesses. The tower helps prevent power outages, spikes and surges from corrupting your data, and the SmartConnect function lets you view the status from your phone or tablet. Helps provide protection for your important equipment. 6' cord provides extended reach when needed. Helps provide protection for your important equipment. Safeguards against outages, surges and spikes. 8 surge-protected outlets let you plug in multiple devices. Cloud-enabled SmartConnect allows you to monitor status updates over the Internet using your mobile device. Delivers automatic notifications, firmware updates and advanced support. Bright, easy-to-read LCD provides intuitive navigation keys and real-time status updates. PowerChute Business Edition software helps ensure safe shutdown should an extended outage take place. Pure sine wave output offers compatibility for active Power Factor Corrected servers and sensitive electronics. Keeps voltages at a safe level thanks to Automatic Voltage Regulation (AVR). Green mode uses less battery power for efficient operation. Helps predict when the battery will need to be replaced. Automatic Voltage Regulation (AVR) adjusts high and low voltages to a safe level, ensuring your equipment had reliable power and preserving the life of the battery. 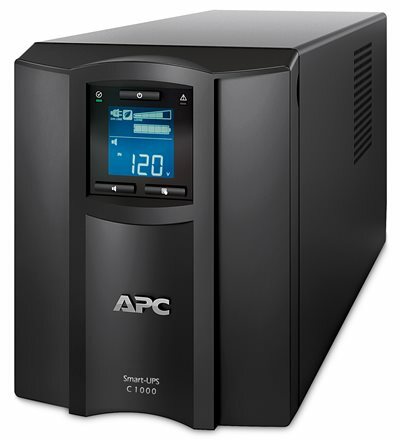 APC SmartConnect makes the legendary Smart-UPS more adaptable and easier to deploy than ever before, enabling you to view the status of your UPS through a secure web portal. Maximize the life span of the UPS and protect your investment with proactive alerts for firmware upgrade, device maintenance, and protection. Connected Smart-UPS are for small to medium businesses who do not have the time or resources to monitor their UPS devices. Through the cloud connection we are able to provide timely, pro-active information and provide enhanced levels of support. Where should Connected Smart-UPS be used? Distributed IT environments or edge computing applications where there is a need for UPS device monitoring. Yes, APC SmartConnect is compatible and has seamless integration with leading RMM solutions (Kaseya VSA and ConnectWise Automate), so you can manage customer portfolios from a single platform.